got his positive keuring result after successfully completing his suitability test in spring of 2000. He was successfully shown in material classes as a three year old. His stallion performance test was in the better middle field, where his show jumping, character and eventing jumping technique got rewarded with the highest scores. He is consequently breed for jumping. 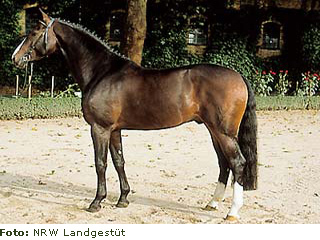 His sire Lancer III was especially successful with Toni Hassmann in the saddle and won roughly Euro 25,000. Lancer III offspring are easily found in the successful show results in the sport. Lacock’s dam is a daughter of the famous jumping horse producer Pilot. Lacock is entered in the stallionbook I of the registrations Rheinland and Westphalia . He is with the Landgestüt Warendorf.